The Frugal Burqueño: Time for my giveaway! 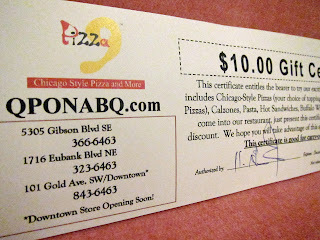 Thanks to QPONABQ.com I am giving away a $10.00 gift certificate to Pizza 9 (three participating locations). To enter, join this blog, follow me on Twitter or like my FB page . Then, leave a separate comment for each you do (more comments-more chances). Please share any thoughts on pizza that come to your mind :) and don't forget to leave your name, twitter id, etc. On Monday, November 21st I'll use random.org to pick up a winning comment number. If for some reason I cannot contact the winner I will ask him or her to email me. Good luck! P.S. We did try this pizza and we liked it! Sweet!! Congrats on the giveaway!! You're doing great!! I follow your blog on google reader. 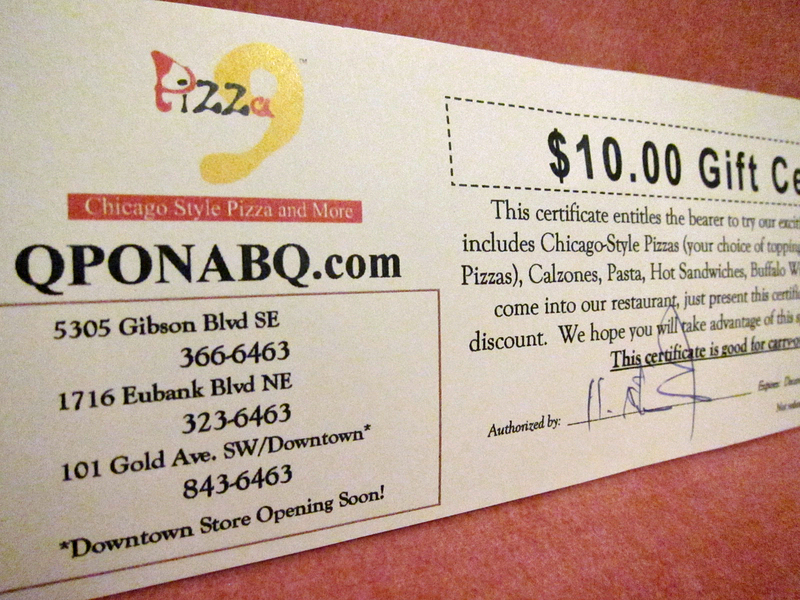 I have never tried Pizza 9, and winning a gift certificate would be a nice way to try them! I don't just follow your blog, I LOVE your blog! and now I am following on facebook!! Thanks! The number I got on the random number generator was 4. The 4th comment was left by Lenijay- congrats! You won :) Please check your email. Thank you everyone for your participation and stay tuned for more giveaways!